See also: 2006, 2007 and 2009. 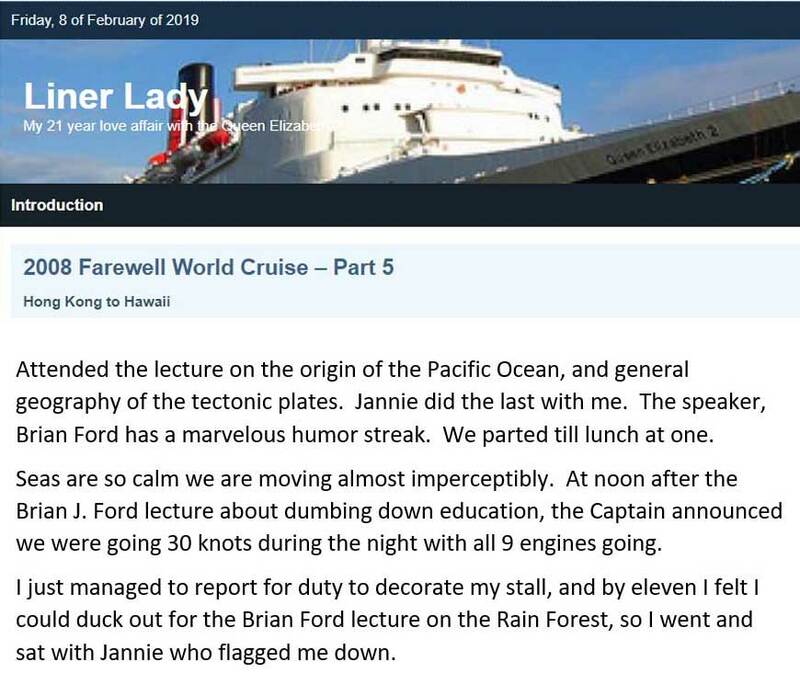 BJF, 2007-8, Illustrated presentations aboard M/V Spirit of Adventure 'Christmas in Antarctica' expedition. Cruise Videos - the good, the bad and the dreadful, Sirocco Lounge, 1600-1645h, 07 January. [See also Spirit of Adventure Today: 3, 6 January 2008]. Sailing: Buenos Aires, Argentina; Grytviken, South Georgia; Stromness, South Georgia; Gold Harbour and Drygalski Fjord, South Georgia; St Andrew's Bay, South Georgia; Stanley and Sparrow Cove, Falklands; West Point Island, Falklands; Penguin Island, South Shetland; Brown Bluff and Esperanza Research Station, Antarctica; Barrientos Island; Yankee Harbour, Greenwich Island; Gonzales Videla Research Station and Neko Harbour, Antarctica; Verdansky Research Base, Antarctica; Planeau Island, Argentine Islands; Port Lockroy and Jougla Point, Antarctica; Ushuaia, Argentina. 18 December 2007 - 9 January 2008. BJF, 2008, interviewed on cultured meat, BBC Radio Five Live, 3 January. BJF, 2008, The Intelligence of Cells, illustrated presentation to Oxford University Scientific Society, Inorganic Chemistry Lecture Theatre, South Parks Road, Oxford University, 2000-2100h, 30 January. BJF, 2008, Presidential Report, Annual General Meeting of Association of Past Students, Main Building, Cardiff University, 1900-1930h, January. Ferarri, Nick, 2008, interviews Brian J Ford on report from Health Protection Agency on global warming and disease, 0735-0740h, LBC Breakfast Show, prod: Alex Mahdavi, 13 February [mp3 recording in archive]. BJF, 2008, The Intelligent Cell, presentation to discussion meeting at Café Scientifique, Science Centre, Singapore, 1900-2030h, 3 March. BJF, 2008, The Secret Language of Life, Illustrated Presentation to Raffles Junior College, Singapore, 4 March. BJF, 2008, The Intelligent Cell, repeat of British High Commission Distinguished Visitor Lecture, Singapore Science Centre, 1500-1600 h, 5 March. Interview, 2008, Pre-recorded interview on career and current work, etc., PrimeTime programme, Channel News Asia TV, 1100-1115h, 10 March. How Not to Photograph your Cruise, QE2 Theatre, 1430-1515h, 13 March. The Secret Language of Life, QE2 Theatre,1215-1300h, 15 March. Mysteries of Water, QE2 Theatre,1215-1300h 17 March. The Cruise Menu of the Future, QE2 Theatre,1000-1045h, 18 March. Forgotten Amateurs who Created the Modern World, QE2 Theatre, 1000-1045h, 22a March. Microbe Miracles, QE2 Theatre, 1215-1300h, 23 March. Surprising Future for the Jungle, QE2 Theatre,1100-1145h, 28 March. Wising Up to Dumbing Down, QE2 Theatre,1100-1145h, 29 March. [Online report by passsenger. See also: report (2008) QE2 Daily Programme: 1 (with photograph), 11 March; ibid: 2 (with photograph), 13 March; ibid: 1 (with photograph) 14 March; and others]. Sailing: Singapore; Vung Tau, Viet Nam; Hong Kong, China; Shanghai, China; Osaka, Japan; Honolulu, Hawaii; Lahaina, Lahaina, Maui; Lanai and Molokai, Hawaii; Los Angeles, California, 10-30 March. BJF, 2008, Toast our Fenland Rice (April Fool's Day spoof) with colour photographs, Cambridge Evening News: 85, 1 April. BJF, 2008, Chairman's address for Dr Jonathan Milner's lecture: The story of Abcam, Selling Antibodies On-line, Cambridge Society for the Application of Research, Churchill College, Cambridge, 1930-2100h, 28 April. BJF, 2008, World's Worst Microscopy, address to California Association of Criminalists Conference, San Diego: 1030-1100h, 8 May. BJF, 2008, Quest for Conviction – Words, Reality, and the Dando Shooting, address to California Association of Criminalists Conference, San Diego: 0900-0930h, 9 May. BJF, 2008, How Cells Show Intelligence, Illustrated presentation to Georgia Microscopical Society, Winfield Hall, Duluth, 01800-1900h, 9 May. Levine, Ketzel, 2008, interviews Brian J Ford on 'tissue cultured meat', National Public Radio, 19 May. [Interview on file as mp3]. Burrows, Andy, 2008, interviews Brian J Ford on Cambridgeshire Calling, BBC Radio Cambridgeshire: 0900-0930h, 29 May. [Interview on file as mp3]. BJF, 2008, Chairman's introduction to lecture by Skip Palenik, 'I can prove you were there - forensic microscopy', Cambridge Society for the Application of Research, Churchill College, Cambridge: 1930-2100h, 2 June. Pearson, Mark, 2008, Village hall dream is step closer to reality, Peterborough Evening Telegraph, 28 June. BJF, 2008, Ingenuity and problem solving by cells, illustrated presentation to joint meeting of California Association of Criminalists and San Francisco Microscopical Society, Oakland, California, 3 July. An Evening with Brian: Inter Micro, the First Sixty Years, Illustrated presentation for Inter Micro 2008, Chicago Shoreline Cruises, M/V Celebration: 1900-2100h, 7 July. BJF, 2008, Ingenious Living Cells: 1115-1140h, 8 July. BJF, 2008, The World's Worst Microscopy: 1530-1550h, 9 July. Inter Micro 2008, Chicago, McCrone Research Institute, Chicago. Microbe Miracles, Maro Polo Lounge, 1400-1445h, 11 August. Sailing: Tilbury, London; Honfleur, France; St Helier, Jersey; Cork, Ireland; Glengarrif, Ireland; Killybegs, Ireland; Belfast, Ulster; Stornaway, Hebrides; Kirkwall, Orkney; Leith & Edinburgh, Scotland; Tilbury, London. 30 July - 10 August. [Elsworthy, John], 2008, Village hall on target (with colour photo of committee), Cambs Times: 5, 1 August. BJF, 2008, review of Beyond the Islands, by James Mitchell, Biologist 55 (3): 188, August. Rhodes, Stephen, 2008, interviews Brian J Ford on exam standards, Breakfast Show, BBC Three Counties Radio: 0725-0730h, 14 August. [Elsworthy, John], 2008, Big boost for students [report on Storers grants, with photograph], Cambs Times: 9, 13 September. BJF, 2008, illustrated presentations aboard the Princess Cruises: M/V Pacific Princess, Crimean & Aegean Coasts cruise. Microbe Miracles, Cabaret lounge: 1400-1445h, 24 September. The laughable world of the Expert, Cabaret lounge: 1345-1430h, 27 September. Sailing: Athens (Piraeus), Greece; Istanbul, Turkey; Yalta, Ukraine; Odessa, Ukraine; Varna, Bulgaria; Volos, Greece; Santorini, Greece; Sorrento/Capri, Italy; Rome (Civitavecchia), Italy. 17-29 September 2008. Naughtie, James, 2008, interviews Brian J Ford on 'intelligent cell' lecture, BBC Today Programme, 20 October: 0720-0725h [recording in archive]. BJF, 2008, Intelligence and the Living Cell, Presidential lecture to Cambridge Society for the Application of Research, Churchill College, University of Cambridge, 1900-2130h, 20 October. Clark, Billy, 2008, Brian Ford silences James Naughtie, report on the Lecture List: www.lecturelist.org, 20 October [screenshot in archive]. Dobbie, Peter, 2008, interviews Brian J Ford on 'intelligent cell' lecture, BBC World Update (presented by Dan Damon, producer Julia Whitehead) 21 October [recording in archive]. Waite, John, 2008, features item from Today programme ['this momentous encounter'] Pick of the Week, BBC Radio Four: 1815-1900h, 26 October [recording in archive]. Havergal, Chris, 2008, Americans in region watch Obama win [quotes Brian J Ford], Cambridge Evening News, 5 November. BJF, 2008, Inter Micro - the first sixty years, The Microscope 56: 67-85. BJF, 2008, Microscopical substantiation of Intelligence in Living Cells, In Focus, Royal Microscopical Society 12: 6-21. BJF, 2008, illustrated presentations aboard the Cunard: M/V Victoria, Caribbean Celebration cruise. Return to previous year 2007, or next year 2009.